Planning to attend college or go back to school soon? Financial aid can be a big help in terms of making higher education more affordable for you. In 2014-2015, at least 2/3 of full-time students received financial aid in the form of grants and federal loans. In order to see if you qualify for financial aid, you need to fill out the Free Application for Federal Student Aid (FAFSA). Here are a few things to keep in mind when filling out the FAFSA. I know this sounds like a no-brainer, but there are quite a few student aid websites out there and you want to make sure you are on the right one so you can complete the FAFSA application. Plus, you don’t want to share any of your information on a different website. The correct website you need to visit to start the FAFSA application is: fafsa.ed.gov. In order for your FAFSA application to be considered complete, you need to make sure you submit all the information that is required. You’ll need to enter personal information like your name, address, and social security number, answer a series of questions to determine your dependency status and share income for your household. If you are considered a dependent student, you’ll need to submit your parents’ tax forms from the previous year. If you are considered independent, you can submit your own tax forms instead. For the 2017-18 FAFSA, families are allowed to submit their prior-prior year tax information meaning their 2015 tax forms. There is a deadline to complete the FAFSA that you must meet if you want to be considered for financial aid. In previous years, the FAFSA used to be available beginning in January each year but recently, it became available in October 2016 for the 2017-18 school year. This means students have more time to fill out their application and you could actually start now if you wanted to. However, if you don’t get all your materials in by the deadline, you won’t be considered for financial aid and you’ll need a wait an entire year before applying again. State and individual colleges and universities may have their own FAFSA deadlines but the federal deadline is June 30, 2018, so you still have plenty of time. 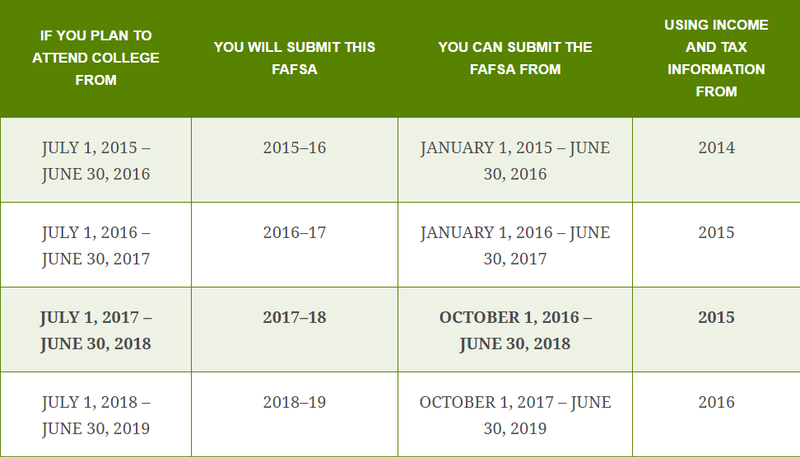 Below is a summary of key deadlines for the FAFSA depending on when you wish to attend school. This information was taken from the StudentAid.gov website. Also, be sure to ask the college or university you wish to attend to confirm the FAFSA deadline with them and mark the date(s) on your calendar so you won’t forget. When filling out the FAFSA, it’s important to have a general idea of which colleges you’d like to attend, because you’ll be asked to list them during the application process. 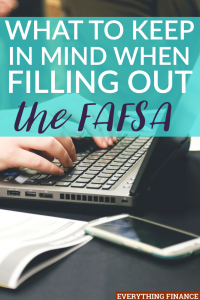 You’re asked to do this because the federal government will send your FAFSA information to the schools of your choice so their financial aid department will already have your information on hand if you decide to go there. Be sure to add some schools to your FAFSA application because it will end up being very convenient for you. You can look up school codes through the FAFSA application and even if you are just thinking about attending a school or still in the process of applying, feel free to add the school to your list anyway. If you make a mistake on your FAFSA application or need to update some of your information, don’t freak out. It’s perfectly fine to log in and make corrections to your FAFSA application. Once you submit it, it will take 3 days – 3 weeks to receive a response and see if you are awarded any aid. This is why it’s important to get your application in way before the deadline so you have plenty of time to make changes if need be or wait on a response. Reviewing your financial aid package can be a nerve racking process. After you’ve been accepted into the school(s) of your choice and after your FAFSA application is processed, you’ll receive a financial aid award package which may include need-based and non-need based federal and state aid based and possible even aid from the college you plan on attending. After your FAFSA is processed, you’ll receive an Expected Family Contribution Number (EFC) which will determine how much aid you can receive. The lower your EFC number, the more aid you’ll qualify for. For example, if your EFC is 0, you’ll qualify for the maximum amount of financial aid. If this is the case, you’ll be able to choose from federal and state grants along with federal loans. It’s always best to choose grants over loans because you won’t have to pay grants back. Yet and still, grant funding may not cover your entire tuition (even though it will help) so you may need to search for additional funding. Some students may qualify for a Federal Work Study, which will allow you to get a part-time job at your school and earn money that can be used to fund your education. If the FAFSA determines your EFC and it’s not low, that means they believe your household income is high enough for you to be able to afford college. While this may or not be the case in reality, quite a few students whose parents have a moderate or higher income will receive results like this. Therefore, you may not qualify for any grants but you may be able to take out loans. Before you take out any federal student loans, explore other options for funding or consider a more affordable school to relieve financial pressure. Your award letter may include scholarships colleges would like to offer you based on merit, athletics etc. which could help cover the cost of college. You could also search and apply for private scholarships as well. You may also be able to work at your school even if it’s not a part of a Work Study program. Consider these options before taking out loans but if you must take out a small loan, try to avoid getting a private lender since private loans tend to have higher interest rates and fewer relief options. All in all, the FAFSA is worth applying for every year, even though you may not know what you’ll qualify for. The rules and guidelines change often and you want to make sure you don’t miss out on any funding since college can be quite expensive. Keep these tips in mind when filling out the FAFSA and be sure to beat the deadline. Have you ever filled out the FAFSA before?